Xeno (pronounced 'Zeno' ) trumpets are designed for those who want power and projection as well as a big warm sound. Developed from more than 30 years' research with leading artists throughout the world, Xeno trumpets incorporate their dreams, their experience, and their talentsâ€”as realized through the skills and ideas of some of the world’s best designers and craftspersons. Traditional hand-craftsmanship augmented by cutting edge manufacturing technology has created an extraordinary quality of unprecedented consistency. The Xeno' s heavyweight construction produces a solid tone core for a rich strong sound that won' t spread or break up no matter how hard you push it. It blows freely and comfortably, while still providing enough air resistance for quick response and superb tonal flexibility. And the hand-hammered one-piece bell gives an agile, quick response with a beautiful tone. 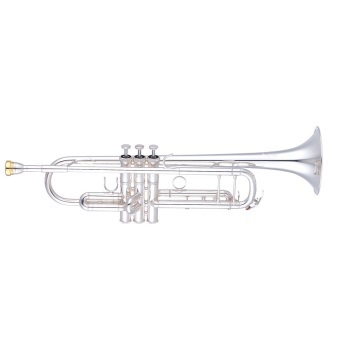 Xeno Bb trumpets offer a choice of bore sizes; medium large for versatility, and large for a broad sound with plenty of power. Bell material options for Bb and C Xenos include; yellow brass - for clear sound with strong projection, and gold brass – for warmer, deeper sound.